The AAT2801 is a member of AnalogicTech's Total Power Management IC (TPMIC) product family. It has a dual Charge Pump architecture designed to support both the white LED backlight and Flash applications for systems operating with Lithium-Ion batteries. The backlight Charge Pump provides power required to drive up to four LEDs To maximize power efficiency, it automatically selects 1X, 1.5X, or 2X mode. The device produces current levels up to 30mA on each of its four current source outputs AnalogicTech's Simple Serial Control (S2Cwire Interface is used to enable, disable, and set the LED drive current with a 32-level logarithmic scale LED brightness control. The Flash Charge Pump is a Charge Pump doubler with a regulated output voltage. It is designed to deliver 150mA of continuous current and up to 250mA of pulsed current. It has an independent enable pin for improved power savings. The AAT2801 is equipped with AnalogicTechs AutoBias technology which allows individual LEDs to be powered either by Charge Pump or battery input, determined internally and automatically to maximize the power efficiency even with a large difference in LED forward voltage. The AAT2801 has thermal protection and built-in soft-start circuitry. A high Charge Pump switching frequency enables the use of very small external capacitors The AAT2801 is available in the 16-pin TDFN44 package. By Advanced Analogic Technologies, Inc. This is one package pinout of AAT2801,If you need more pinouts please download AAT2801's pdf datasheet. 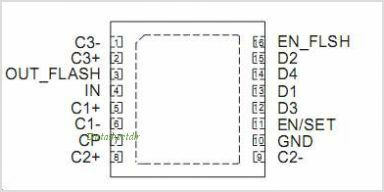 This is one application circuit of AAT2801,If you need more circuits,please download AAT2801's pdf datasheet.